Recently traded Raptors sensation Delon Wright surprised fans as he approached the locker room, red-carpet style, HUNGRY! Nothing good happens when an NBA player forgets to eat before a big game. The ex-Toronto Raptors point guard made a hungry decision and wore a ridiculously oversized suit, perhaps a throwback to 2003, on his tunnel walk to the locker room. Just hours before one of the biggest games of the year, the usually fashion-forward Wright made the unexpected fashion statement by sporting a suit that reminded many basketball fans of the 2003 NBA draft class. 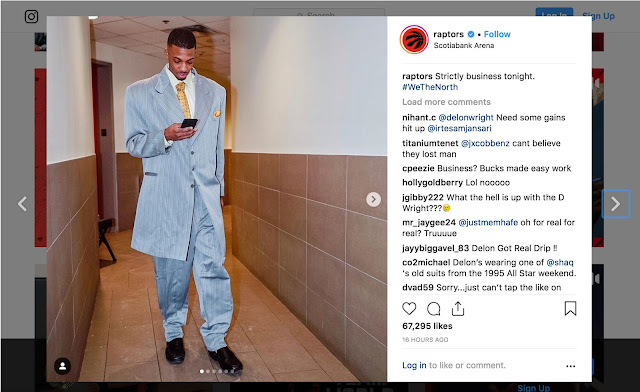 When an image of Delon in the getup was posted to the Raptors social media accounts just before the game, the story went viral. Within hours Wright was a national trending topic on Twitter and had been meme-ified dozens of times over. National sports publications, including Sports Illustrated, ESPN, Bleacher Report and Sportsnet, had all weighed in on the picture. The next morning, the picture set NBA Twitter ablaze and generated over 15 million impressions. Most fans assumed this was a questionable fashion choice, but the next day it was revealed to be the result of an empty stomach when Wright went online to thank Snickers for satisfying his hunger and saving basketball fans from any future fashion fiascos. The stunt was a continuation of Snickers’ longstanding “You’re Not You When You’re Hungry” campaign and an amplification of their ongoing partnership with the Toronto Raptors. The campaign stunt was conceived by BBDO Toronto and executed on social media by FleishmanHillard HighRoad (organic) and Mediacom (paid strategy). The stunt proved that not only are you not yourself when you’re hungry, you also lose your swag. Hopefully Delon eats a Snickers before the next big game.